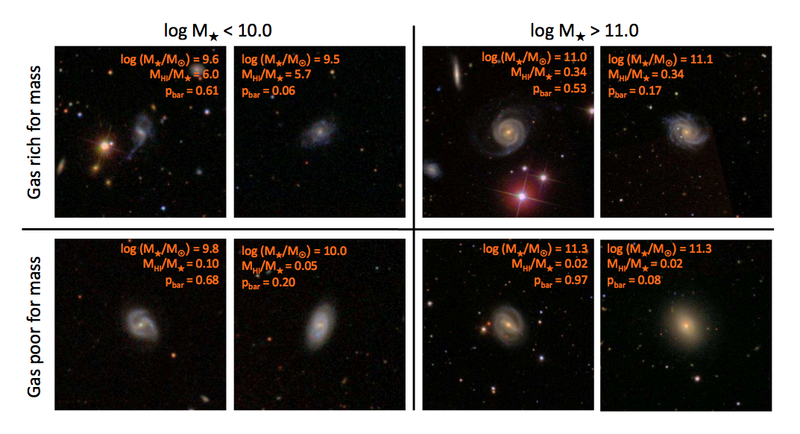 I’m delighted to announce that the latest paper based on Galaxy Zoo classifications was accepted to appear in the Monthly Notices of the Royal Astronomical Society earlier this week, and appears on the arxiv this morning (link). So what was new about this paper was that we combined information on the morphologies (whether or not the spiral galaxies had bars) with information on the amount of atomic hydrogen gas the galaxies contained and and our main result was that galaxies with more atomic gas in them, are less likely to have a bar. But I want to back up a bit first and tell you about where we get this information on the atomic gas content, and why it might be interesting. As you might guess from the title of the paper it’s from something called the ALFALFA survey (and the new names in the author list for a Galaxy Zoo paper – Martha Haynes and Riccardo Giovanelli – are from Cornell University who are running this survey). Atomic hydrogen emits radio waves at a frequency of 1.4 GHz (or 21cm). This is detectable by a classic radio telescope (in what we call the “L”-band which makes up the second L of ALFALFA). 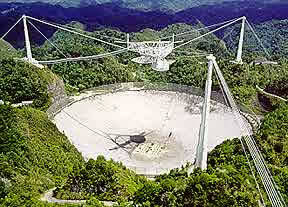 In the case of ALFALFA, we use the Arecibo radio telescope (two of the “A”s in the acronym stand for Arecibo, the third is for array), which is the worlds biggest single dish radio telescope deep in the jungle of Puerto Rico. Aerial shot of Arecibo. Credit: NAIC. Atomic hydrogen is the basic building block of galaxies (after dark matter). It represents the fuel for future star formation in a galaxy – a galaxy with a lot of atomic hydrogen could in principle make a lot of new stars. Many spiral galaxies have a lot of atomic hydrogen (with perhaps as much as 10 times as much mass in hydrogen as in stars! ), while a typical elliptical galaxy has very little atomic gas, and so cannot form lots of new stars. So our observation that bars are more likely to be found in spiral galaxies with less atomic gas supports our earlier ideas about bars possibly “killing” spirals (ie. helping to stop them form stars). Trends of bar fraction with atomic gas content, galaxy colour and how many stars are in a galaxy. Of course it’s never quite that straightforward with galaxies. To start with correlation is not the same as causation, and to that we add that lots of things are correlated. We show some of that in the figure above. Bars are more likely in redder spirals which have more stars (“log Mstar” represents stellar mass in units relative to the mass of our Sun) and which also have less atomic gas. So the skeptical astronomer could say this has nothing to do with the gas content at all, just that the types/sizes of galaxies with less bars have more gas. To test that idea we measured the typical gas content of a spiral galaxy with a given number of stars, and from that we calculated how “deficient” or rich in atomic hydrogen any given galaxy was. Then we plotted the bar fraction against that. The convention in astronomy is to call how much less atomic hydrogen a galaxy has than normal it’s “HI deficiency” which gets bigger the less atomic hydrogen there is (from the people who brought you the magnitude scale!). Bar fraction against how much more or less atomic gas a galaxy has than is typical for the number of stars it has. 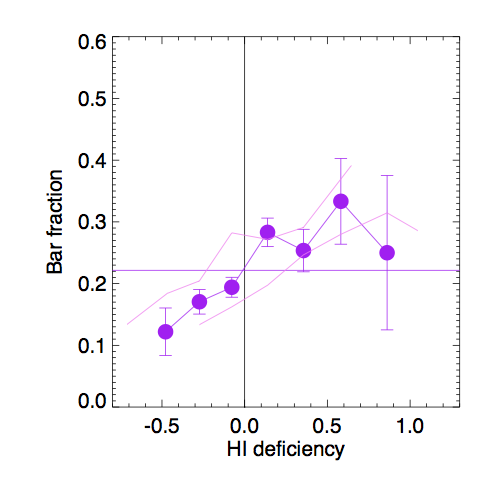 Bigger HI deficiency = less atomic gas than is normal for a galaxy’s size. Anyway you can see we still see a clear trend, which demonstrates that it’s likely to be the atomic gas driving the correlation. Where a galaxy is richer in atomic hydrogen than normal it’s less likely to host a bar, and vice versa. Very atomic hydrogen rich galaxies which are massive and have bars are really quite rare! I made images of the whole sample we use available here. At the end of the paper we put forward three possible explanations for the correlation, all of which fit in with the observations we presented. It’s possible that the bars are causing the atomic gas in galaxies to be used up faster – “killing” the galaxy. The bar does this by driving the gas to the centre of the galaxy where it gets denser, turns into molecular hydrogen and from that stars (but only in the centre). It’s also possible (based on dynamical studies of galaxies) that gas slows down the formation of a bar in a spiral galaxy, and/or destroys the bar. Finally it’s possible that as a galaxy interacts with its neighbours, a bar gets triggered and its gas gets stripped (ie. the correlation between the two is caused by an external process). We’ll need to do more work to figure out which of these (or which combination of them) is the most important. To my mind the most interesting result was a hint that if a gas rich galaxy does (rarely) host a bar, it’s optically redder than similar galaxies without bars. It’s just possible that bars hold back infall of gas from the outer regions of a spiral galaxy and slow down star formation over all in that galaxy. That idea needs testing, but if it’s true it’s saying that an internal structure like a bar plays an important role in the global star formation history of a galaxy.